The Long Island law firm of Rubin & Licatesi, PC has successfully defended their client’s property against foreclosure efforts by a lender with evidence of “Robo-Signing” practices by the bank. In the case of Countrywide Home Loans, Inc. v. Harold Levinson [Index No: 2007-25351], Countrywide began this foreclosure action in 2007. In a recent decision before the Honorable Justice Spinner, Supreme Court, Suffolk County, the court ruled that Countrywide may not have standing to proceed in this lawsuit with its mortgage foreclosure action. The Plaintiff allegedly participated in questionable “robo-signing” procedures and may have acted “fraudulently, dishonestly, in bad faith or in an unconscionable manner,” as stated in that decision. Countrywide’s application for judgment of foreclosure was subsequently denied. “Our client was in default for many years and was concerned about the loss of his rights and his home. He hired our firm to defend against the foreclosure of his home in a” Robo-Signing case,” said firm partner Richard Rubin. “We are proud that our client was granted the right to voice and protect his rights and that the Robo-Signing issues will be openly brought to light. Since the 2006 housing crisis, the media and courts continue the diligent inquiry and investigation of the mortgage lending industry for using false affidavits in thousands of foreclosure cases. Many details have now been disclosed regarding erroneous foreclosures and evictions. Following the "robo-signing" scandal, the major lending institutions foreclosure practices and their attorneys remain under scrutiny. “Our client’s case is significant because it once again brings to the forefront the issues of Robo- Signing and that the courts will provide diligent and due inquiry into these substantial and very real legal issues," added Richard Rubin Esq., a partner in the law firm of Rubin & Licatesi PC. 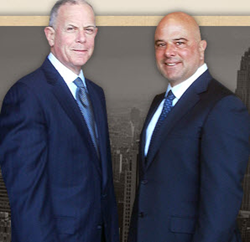 The attorneys at Rubin & Licatesi, P.C. provide legal representation with a unique focus in two distinct areas: personal injury and real estate. The personal injury division handles automobile accidents, construction cases, slip and fall accidents, catastrophic injuries resulting from someone’s negligence and products liability. The firm’s real estate attorneys handle cases involving residential and commercial real estate closings, civil real estate lawsuits and the defense of mortgage foreclosure actions and loan modification matters. With their home office centrally located in Garden City, New York, the firm’s attorneys are able to easily serve clients’ legal needs throughout Nassau and Suffolk counties in Long Island, as well as in all of the five boroughs of New York City. For more information about the firm, contact Rubin & Licatesi at 516-204-7715 or visit their website.